I have always loved Tucker's stories but this one resonated with me so strongly, that even weeks later, I catch myself thinking about the characters and story still. Truly one of, if not, my favorite stories by her yet. I'm so excited to be a part of this tour and to tell you, if you are a fan, run, and grab this one. You won't be disappointed. She is the USA Today bestselling author of 17 books, including the Causal Enchantment, Ten Tiny Breaths and Burying Water series, He Will Be My Ruin, Until It Fades, Keep Her Safe, and her upcoming contemporary fiction, The Simple Wild. Her books have been featured in national publications including USA Today, Globe & Mail, Suspense Magazine, and Publisher's Weekly. Beautifully laid out and told, The Simple Wild will resonate deep within you on so many emotional levels it will simply take your breath away. 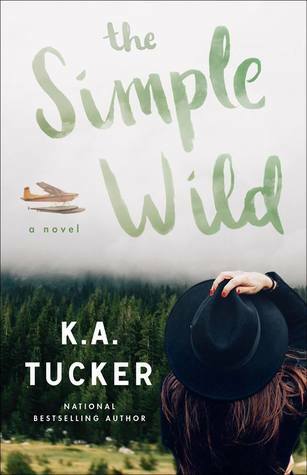 Rich is family relations and what really makes and breaks a family, The Simple Wild will have you captivated after the first heartbreaking chapter. Heartfelt every bit as much as it was sometimes heartbreaking, Tucker once again created a charming tale that was hard to put down and let go of. I thought about this long after I put it down and way into the next few days. The story haunted me on so many levels as I related to the characters and fell in love with just about everyone. One of my top reads not only of this year, but of a lifetime. Yup, this was really good. I connected a lot with the situation with her and her dad. YES! This was absolutely brilliant and I loved how much so many readers resonated to the story. Lovely review! Yes! So true. I have yet to see a bad review for it. I've heard so many amazing things about this book! Great review! Definitely and I do hope you give this one a try, so worth it!! I gotta get my hands on this one Kindlemom. Thanks for sharing your thoughts! Oh definitely Debbie, I think you will love it. I am going to have to get this one. It is good when a story resonates,within you. I highly recommend starting with this one. I haven't read anything by this author but this one sounds great. I'm definitely adding it to my TBR. Great review!! So excited to hear you say that, I think you will love this. I really do as well, they really do have such an impact. I adore this author. I am so glad it was a top read for you Ali. Everyone is loving this book. I have the audiobook on hold at my library, just waiting to get my grubby paws on it! Sounds like a winner! I'm almost 100% sure you will love this too Heidi. Christy and Kim both loved it as well. I will pick up a book by this author! Oh this sounds brilliant. I'm going to have to see if my library has this title. Yes please do, it really is a lovely story. Tucker is such an awesome author. I love her stuff. I love books that you just can't stop thinking about after reading. Thanks for sharing your lovely review!! Wow, what a fabulous recommendation. I love books that stick with me for a long time. There really aren't that many. That is very true so when you do happen upon them, they really do stick out and you remember them for a long time. I love when a book can affect me days after I've read it. I really do too, they are the best. Wow, this sounds fabulous. And it's like the third positive review I've seen in the last few days, so clearly it's doing something right! I'll have to add this one. Yay! So happy you are Greg, hope you love it too! I've heard really great things about this author, but haven't tried her yet. Looks like this is one to try. Thanks for sharing. This one really is a must Melanie! I've never read any books by K.A. Tucker but have heard great things about her writing! So glad this was a winner read! I absolutely agree with everything you wrote. I've already read it twice. I would recommend this to everyone. Yay! So glad you loved this too Lorna, it really was so fabulous! I've seen this author's name quite a lot but haven't picked up her books. I love when you personally connect to a book. Since you love it so much, I'm going to see if my library has a copy. Yay! So excited for you to try this one! It's wonderful when one just sticks with you. I could not agree more. Love Tucker and this was one of her best yet! Love that it hit you so hard emotionally. I'm already a fan and can't wait to snag this one. Yay! You are going to love it too I think, so good and I've yet to see a bad review for it.